I know, I know it sounds like a bad foodie nightmare, but really it is quite delicious. 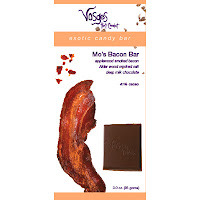 I recently discovered Mo's Bacon Bar by Vosges Chocolates. It is a dark chocolate candy bar with bits if applewood smoked bacon and smoked salt inside. It sounds bizarre, but I think it brings a new fun spin on the regular ole' chocolate bar. PS: You may think I am getting a kick back from this company, but I really just love the candy! I wish I was! Given as a thank you gift following a round of golf and dinner at home, my hosts (actually, hostess, who precluded the host from sampling)in Charlotte didn't stop talking about these chocolates for a year.